It’s time to grab the snuggie and warm up with a round of winter cocktails. Fighting off the cold weather with everything from espresso to Cognac, these winter warmers are the perfect way to keep your spirits high when the mercury’s low. Apple brandy mixes with earthy Cynar and dry sherry for a warming effect that will keep you cozy through the night. Shake off the shivers by adding a splash of Jaliscan sunshine in your coffee. The agave nectar whipped cream is good enough to eat with a spoon. Cognac may be the quintessential cold-weather sipper, and with a little crème de menthe, you’ve got the perfect wintertime tingler. Its name says it all—you’re sure to find a taste of winter relief with this blend of bourbon, spice syrup and French-pressed coffee. Keep seasonal sniffles at bay with this comforting combo of rye, Chartreuse and sweet vermouth. It may be iced, but this cocktail with blanket you in the warming flavors of maple, bourbon and apple brandy. Fresh sage and green Chartreuse offer an herbaceous twist on a classic hot toddy. Keep a batch of this warm punch on the stove throughout winter, and you’ll have plenty of visitors all season long. 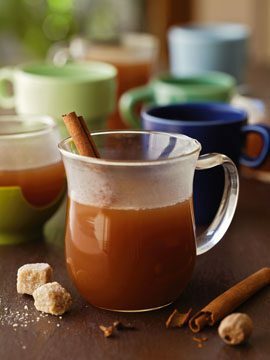 This toddy offer a double dose of spiced rum for extra warmth. There’s definitely something saintly about this combo of espresso, bourbon and five-spice syrup. Kick off your snowshoes and warm up with this plum-y twist on a mulled, fruity classic. Who says juleps are only for Derby season? Combine bourbon with brown sugar syrup and a splash of peppermint tea for this delicious and simple winter warmer.